Due to the fire disasters which have hit the headlines recently, people are now starting to realise the real importance of not only using the correct fire doors, but using fire doors which have been independently tested and have evidence to back up the claims. This is why all of the flush fire doors that we manufacture are made under the EXOVA BM-TRADA Q-mark Scheme, which we are audited every year for and periodically have our doors tested in a furnace to ensure the high standards are maintained. You shouldn’t be purchasing ANY fire door which hasn’t been third party tested as you will have absolutely no way of knowing if it has been manufactured in the correct way as nobody is auditing their manufacturing processes to be sure they are following detail. How do I know if a door is Q-marked? Any door that is Q-marked will be indicated with a coloured plug, usually in the hinge edge of the door. The plug is in two parts, the outer core which identifies the fire rating of the door and then the inner tree which identifies several items, I.e. if the door has been factory glazed, if intumescent strip was supplied by the manufacturer etc. The different combinations are shown below. There is also a unique number on the plug so you can identify the manufacturer. It is important to educate yourself with this as if you had a door in your building or work place that has a vision panel in, the door may already have a plug to show it is an FD30 and that the intumescent has been factory fitted, but there is no plug to show a vision panel has been factory installed, then who has installed this vision panel, have they used the correct glass, glazing intumescent, beads, pins etc? Will this now halt the passage of fire for the required time? Do you want to be the one to find out? How do I make sure my certified doorset is installed correctly? It is all very well purchasing a third party certified door or doorset but if it isn’t installed correctly then this could potentially undermine the rating of the door, so it is vital that you have them installed correctly. 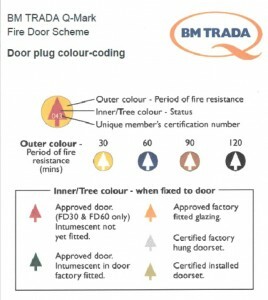 It’s pleasing to see that more and more of our customers are going down the route of becoming Q-marked installers, which is a scheme run by EXOVA BM-TRADA to make the installers aware of everything they need to be checking and following to install the doorset to the correct specification, using the correct products and practices. This also works the other way around, even if you are using certified installers, be sure to check the doors they are installing are also certified, just because you are using a certified installer for it to be a completely certified install they must be using the correct doors. We cannot stress enough the importance of purchasing fire doors from a company who holds an independent accreditation for having their fire doors tested and audited through someone like EXOVA BM-TRADA. If you don’t you are taking a leap of faith into the unknown and another major disaster will only be around the corner. Next blog post Next post: We’ve Moved!